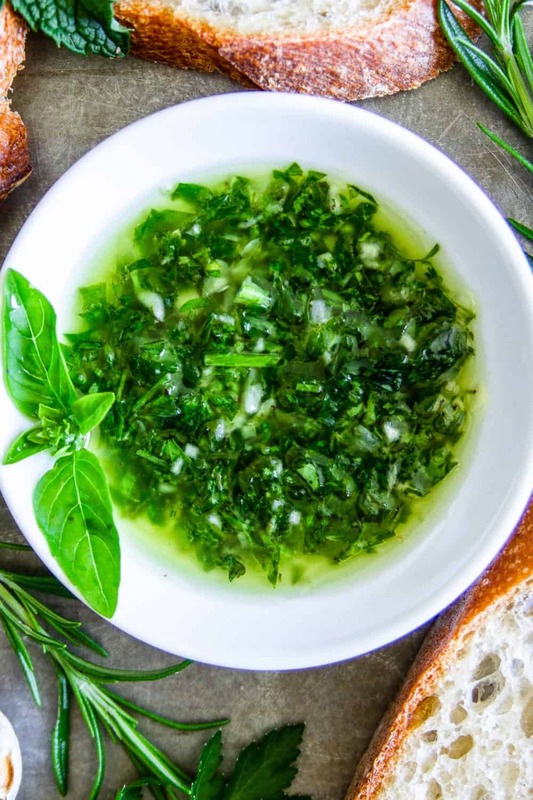 This restaurant-style herbed dipping oil is pretty much always on the menu when we have company over for dinner. When my guests leave they already know I’m sending them home with leftover herb dip. 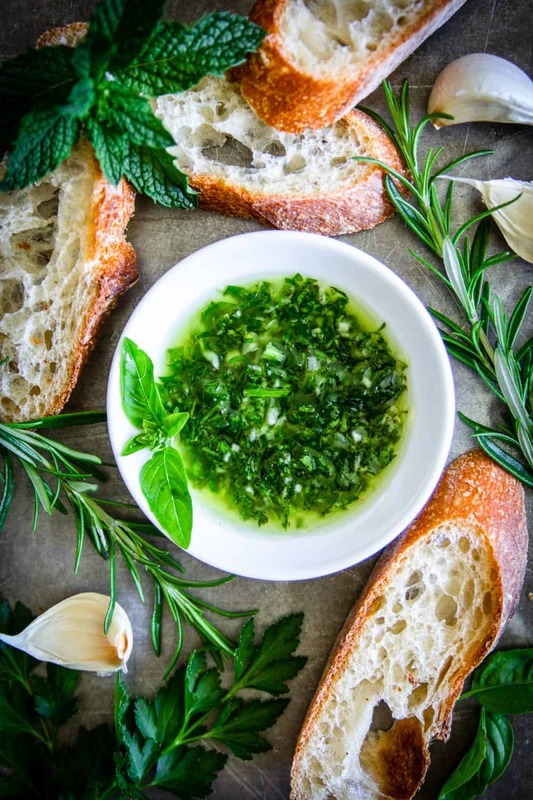 The fresh garlic and herbs paired with a warm rustic baguette is truly a match made in heaven. I actually discovered this herbed oil at one of our favorite waterfront restaurants (Lobster Shop, on Ruston Way, Tacoma). Being a garlic lover, when I first tried it my first thought was, I MUST recreate this at home. Not going to lie I got pretty darn close to the real deal. Since herbs are flourishing right now, I snatched up all my herbs right from my garden. And let me tell you, the aromas and flavors were down right spectacular. 1 . Finely chop each herb, especially the rosemary. Then chop the onion and garlic. 2 . 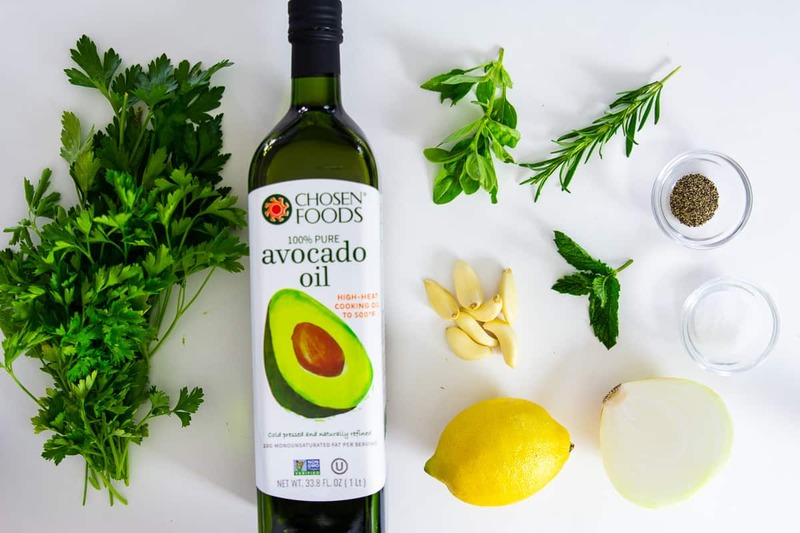 Place the finely chops herbs, garlic, and onion into a small food processor, then add the freshly pressed lemon juice, salt, black pepper, and 1/4 cup avocado oil. Pulse it a few times until the mixture becomes finer. 3 . Transfer the herb mixture into a small bowl and whisk in the remaining 1/2 cup avocado oil. Serve with warm bread. Store in an airtight container in the refrigerator. Finely chop each herb, especially the rosemary. Then chop the onion and garlic. 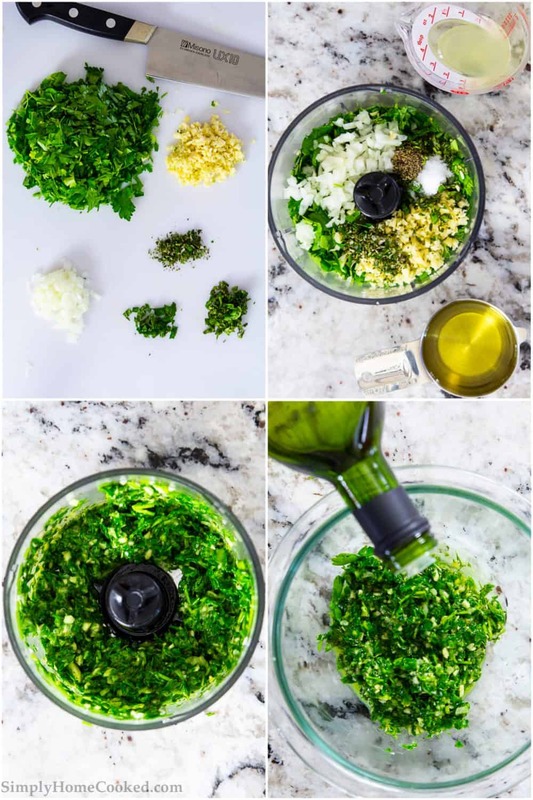 Place the finely chops herbs, garlic, and onion into a small food processor, then add the freshly pressed lemon juice, salt, black pepper, and 1/4 cup avocado oil. Pulse it a few times until the mixture becomes finer. Transfer the herb mixture into a small bowl and whisk in the remaining 1/2 cup avocado oil. Serve with warm bread. Store in an airtight container in the refrigerator.